These little guys must be one of the sure signs of summer. I don't see many around here, but that doesn't stop me from thinking about them. For this project I decided to do things just a little differently. That is my "process" for making a design. I made my pencil sketch as usual. My sketches are usually pretty rough, but I often think they turn out so soft in a way. When I draw them on the computer the hard lines make that softness disappear. So I decided I would try drawing the design with colored pencils too. It was good for me to try this. The colored pencils gave me a certain freedom with shades that I have had a hard time matching with threads. Mostly because I own far from all the crewel shades! But also because the colors blend differently. It was extremely helpful when I was choosing the colors for the project. I referred back to my drawing quite a bit. The goal was never really to copy the colors exactly, but to use the drawing as more of a reference. The shading on the leaf makes all the difference for the project. It really adds the feeling of lightness. In this project, the ladybug simply ended up too small to be shaded though. Well, maybe that is just an excuse!! But I am happy with it anyways. This was a fun project, and it was fun with the drawing. I definitely plan on doing more of this type of thing. Perhaps it will save me some trouble too!!! Now the month of June is nearly out. I am behind, but it's time to get going on my embroidery journal project!! I'm back from family vacation time. I had a great time, but it's always nice to be back to the regular schedule! I'm ready to go on some new projects with some new blogging energy. Hopefully the energy will sustain me for a good while into the future! I've been thinking to do this for awhile, that is to spotlight some of the themes that show up in my embroideries and other works. This time I have chosen the elusive cloudberry! Actually they aren't that elusive, but they are a northern fruit, so they aren't seen down here where I live all that often. That doesn't stop me from including this interesting fruit in my work! I used it in my fruit stumpwork project. I used beads to represent them. The sparkle is a lot of fun! Also I used them in my latest project which was the crewel version of the fruit wreath. I experimented with some different ways to stitch them. 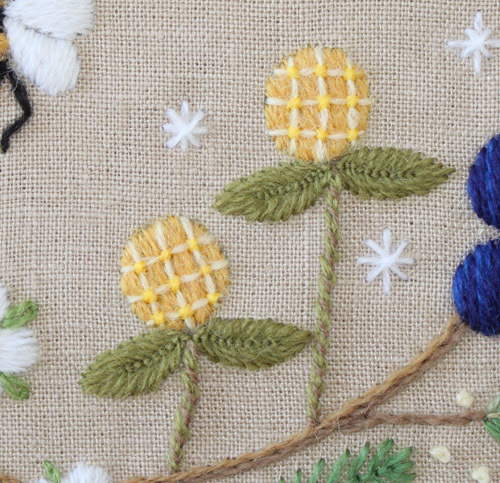 I wanted to avoid another pile of french knots - that idea had already been used a couple times in this project, so I went with a trellis pattern over satin stitching. I have also drawn and painted the cloudberry. First I gave it a try with colored pencils. It's fine, but my pencil lines ended up too heavy. (I've got a lot to learn!!) Paying greater attention to the colors felt like a step forward in any case. Next I tried the same picture but with watercolors. I felt like this was a big improvement over previous attempts with the watercolors, so I was happy enough for the time. It's been rumored that there are cloudberries growing around here too. I had no idea where. But thanks to my cloudberry studies I knew what they looked like, so when I happened upon these guys growing in some mushy land, I was happy to finally have spotted the elusive berry plants! You can be sure I will be watching out to see if these make any berries this summer! !